"These come out very light and fluffy and are full of whole grain. My kids love them! If you like blueberries, throw a few on top before flipping the cake :)"
Whisk whole wheat flour, sugar, baking powder, baking soda, and salt in a bowl. Whisk buttermilk, eggs, and vegetable oil in a separate bowl; pour buttermilk mixture into dry ingredients. Stir just until combined (batter may seem a bit thick). Heat a cast iron skillet over medium-low heat for 5 minutes. Pour 1/3 cup of batter onto hot skillet and use a spoon to spread the pancake a bit. Cook until browned and bubbles appear on top, 1 1/2 to 2 minutes. Flip and cook until browned and set in the middle, about 2 more minutes. Repeat with remaining batter. 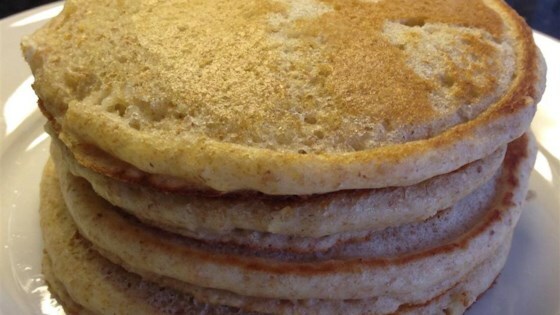 Cups of flour just shy of full will yield a lighter pancake and more traditional batter. I don't like using baking soda as it makes the pancakes taste funny. Loved this recipe! I did substitute coconut oil for the vegetable oil, though.